It is important to identify very concretely the pain and suffering we caused the Vietnamese – a people who only wanted to be independent from foreign occupiers, whether Chinese, France, Japan, or the United States of America. As honorably, and in some cases heroically, our military served and fought in Southeast Asia, we were nonetheless serving as cannon fodder, in effect mercenaries for reasons other than what we were told. When I came to understand the true nature of the war, I felt betrayed by my government, by my religion, by my cultural conditioning into “American Exceptionalism,” which did a terrible disservice to my own humanity, my own life’s journey. Thus, telling the truth as I uncover it is necessary for recovering my own dignity. S. Brian Willson, as a 1st lieutenant, served as commander of a US Air Force combat security police unit in Viet Nam’s Mekong Delta in 1969. He is a trained lawyer who has been an anti-war, peace and justice activist for more than forty years. 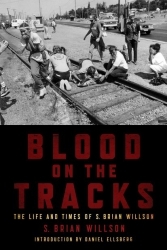 His psychohistorical memoir, “Blood On The Tracks: The Life and Times of S. Brian Willson” was published in 2011 by PM Press. A long time member of Veterans For Peace, he currently resides in Portland, Oregon. This entry was written by brian, posted on at 11:20 am, filed under Brian's Blog, The Most Dangerous of Rogue Nations: The United States, Pax Americana, Vietnam. Bookmark the permalink. Follow any comments here with the RSS feed for this post. Post a comment or leave a trackback: Trackback URL. By Aug.1945 the USSR suffered 20 Million War Casualties.Communist Russia was our Ally. Overnight the USSR became our deadliest Enemy. Positive> Negative; Capitalism> Communism. The Vietnam War was fought to stop Communist North Vietnam conquering South East Asia? The Real reason was, to enrich Eisenhower`s Military/ Industrial Complex.